In September 2015, member States of the United Nations have adopted the new 2030 Agenda for Sustainable Development. This inclusive and transformative agenda sets the strategic direction for building resilient cities and human settlements by responding to concerns about the impacts of climate change and disaster risk. Prior to the SDGs, the Sendai Framework for Disaster Risk Reduction 2015-2030 was adopted as the first of the post-2015 development instruments and this new framework will have a profound impact on the lives of people for years to come. In this regard, building resilience and adapting to climate change is crucial for cities especially those in the Asia-Pacific region. The region is subject to all major types of natural hazards and dominates disaster impact categories across the world. During the past decade the region was struck by 1,625 disasters—over 40 per cent of the global total – and half a million people lost their lives. The region has incurred substantial economic damage of more than half a trillion dollars over the same period, accounting for 45% of global total. Unfortunately, planning and development of cities and local government has given little consideration to the consequences of natural hazards, which are at the forefront of disaster. 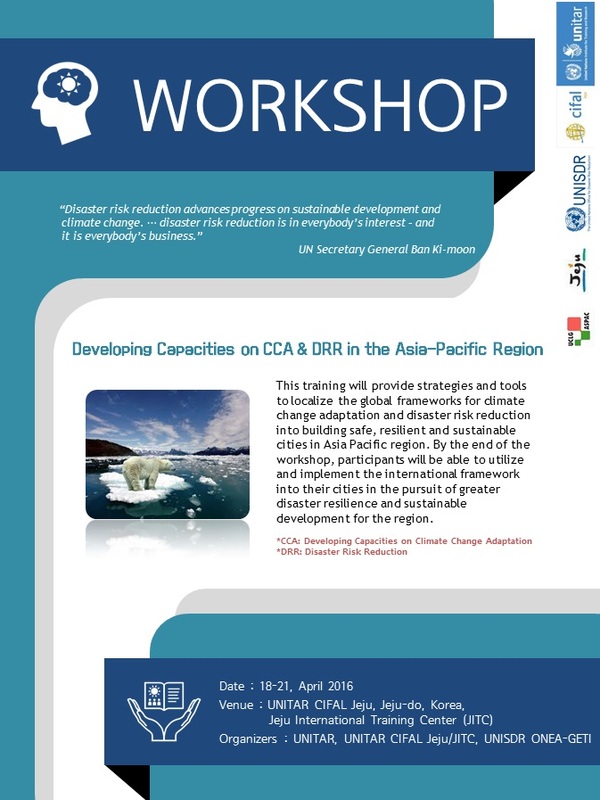 This training will provide strategies and tools to localize the global frameworks for climate change adaptation and disaster risk reduction into building safe, resilient and sustainable cities in Asia Pacific region. The training process includes lecture sessions with expert inputs combined with real-life case work and best practice. Session-based group work will enable participants to transform in-depth learning into practice and familiarize with coordinated action for decision making. By the end of the workshop, participants will be able to utilize and implement the international framework into their cities in the pursuit of greater disaster resilience and sustainable development for the region. in the field of disaster risk management and climate change adaptation. •	share good practices and find ways to cooperate with other participating cities. •	submit necessary documents on time, i.e., registration form etc. •	complete and submit pre-training readings and assignments, i.e. case studies etc. •	Participation is subject to approval of the application by UNITAR CIFAL Jeju/JITC. •	UNITAR CIFAL Jeju/JITC provides a LIMITED (please see the agenda) financial assistance with the airfare to Jeju-do, Republic of Korea. •	Local expenses (transportation, accommodation and meals) during the workshop will be covered. •	All other expenses are the responsibility of the participants.